A project I'm currently working on. 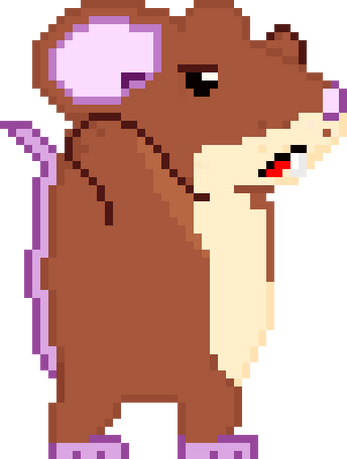 My first game, it's an action platformer inspired by my love of rats. This build is for testing and feedback purposes and has menus disabled. Now that the basic engine is built, I decided to publish this before I start working on the level design. I plan on making the tutorial text more clear, and adding dialogues. The boss will also be more polished in many ways, and entering the boss' wall-hole will exit the first level and begin the second. Right now you can still jump OOB near the boss. I didn't think it would be necessary to put a wall there yet, just know you will not find anything special over there. It should download as a single .exe file. Just run it. if you have a virus scanner, you must wait for the scan to finish before playing as it may crash or restart the game after the scan completes. Thank you. It's my first game ever and it really makes me happy to hear that. I've put so much time and effort into it just to get this short tutorial. Now the engine is almost done and I can start working on level design. Thank you for the positive feedback! It really made my day. Not a problem, honestly thought for your first game, this is great, I normally would tell people not to try something this advanced for there first game, as they tend to find the scope too large and get nothing done. Seriously you should have seen my first ever game! You said Engine? What are you working in ? GameMaker? Unity3d? etc?